It has been more than a month since Nene Sanneh has had any news of her 26-year-old son Mohammed Lamin*. All she knows is that he left their home in the Gambia determined to reach Europe from Libya on a smuggler’s boat. Now she’s looking at an image on a mobile phone of her son aboard The Phoenix, the vessel that rescued him from a stricken fishing boat in the Mediterranean and delivered him safely to Italy. “Albaraka, Albaraka,” she says, expressing her gratitude and relief that her son is alive. The Ceesay family live in a village on the edge of the sprawling city of Brikama, the first stop for many Gambian migrants moving out of the impoverished countryside. Central Brikama is a hub of market stalls and traders, its potholed streets lined with ironmongers and tyre shops, with rows of women selling mangos. The Ceesay compound lies down a waterlogged dirt road, where sand bags and breeze blocks serve as stepping stones through fetid, algae-skinned puddles. The compound is home to Lamin’s parents and 11 children, including those of his older brother Pa and his wife. “You see how we live here? That is why Lamin wanted to go: to find a better life,” says Pa, standing on the veranda, under a tin roof that radiates heat. The Gambia is one of Africa’s smallest countries: a finger of land around its namesake river, with a population of under two million. And yet it consistently ranks in the top six nations with the most citizens taking the central Mediterranean route between Libya and Italy. Gambians have traditionally migrated to find their fortunes, settling throughout West Africa, and much further afield. Remittances from abroad made up 20 percent of gross domestic product in 2014, according to the World Bank. In the 1980s, the destination of choice was Scandinavia, a connection reinforced by the Swedish origins of Gambia’s tourism industry. In the 1990s, it was oil-rich Libya under Muammar Gaddafi. Gambia’s under-developed economy means there are few opportunities at home, especially for the youth. Growth contracted to -0.7 percent in 2014, largely as a result of the impact of the Ebola scare on tourism and the poor seasonal rains on the all-important agriculture sector. Lamin was not jobless (he worked as a mason for his uncle in Senegal), but he saw no real future for himself or his family, which he felt obligated to help. He decided to do something dramatic to try to change their circumstances. With some financing from his eldest brother working in neighbouring Guinea-Bissau to get him on the road, he risked his life on what is known in the Gambia as the ‘back way’: the 5,000-kilometre journey through the Sahel to an insecure Libya, and then a dangerous sea crossing to Europe. When he was rescued from a fishing boat crammed with other migrants and refugees in July, the only personal item he had on him was the paper from a cigarette packet on which he had written an Islamic prayer and the telephone numbers of a few relatives and a close friend. Safely on board The Phoenix, a boat belonging to the Migrant Offshore Aid Station (MOAS), a privately-funded search-and-rescue initiative, he explained to photographer Jason Florio, working on the vessel, why so many other young Gambians were making such an extreme choice. Lamin is among more than 5,500 Gambians who have successfully made it across the Mediterranean to Italy from Libya in the first eight months of this year, according to the latest data from the Italian interior ministry. There were plenty of points during Lamin’s journey when he doubted his decision. 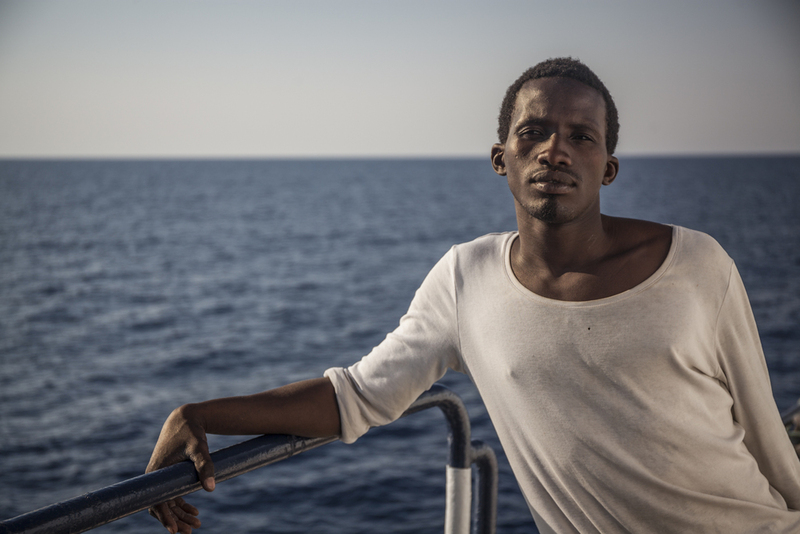 In Libya, having paid a smuggling agent for his passage to Italy – the money raised for him by his family at home – he was kept in squalid conditions in a so-called connection house, until the boat was full. The migrants were told to choose a captain from among themselves and buy their own compass to help them navigate. They soon got lost and ran out of fuel. Fortunately, they were spotted by a helicopter after one of the passengers called a friend in Italy to alert the emergency services. On his way to the port of Pozallo to be processed by the Italian immigration authorities, Lamin beamed when asked how he was feeling. Social media plays a big role in perpetuating this belief. There are stories of migrants borrowing gold chains and posing with sports cars for photos they share with friends and family back home. Some even send home the 40-euro subsistence allowance they receive each month while staying at reception centres in Italy, awaiting a decision on their asylum applications. Back in Brikama, Pa is now the main breadwinner. His father Mamoud is a farmer, growing cashew nuts and maize for the family’s consumption. Inside their dingy home, the plasterboard walls are crumbling and the floors are bare concrete, save for patches of worn lino. A battered wooden dresser is the only item of furniture in the living area. “You see other compounds here and you know if they are better it is because they have a family member in Europe. You can see the difference in how they are built. Some are (two-)storey houses and have solar panels. If you can’t change your circumstances, you have to change your environment,” says Pa.
Lamin’s childhood friend Buba Jallow knew about his plans from the start and understands why he left his job and took the risks he did. “It is very hard here because your family think you are a big man if you are in the city, but there are no good jobs here. That’s why people go the ‘back way’: because they feel the pressure to provide for their families,” says Buba, who sells horse rides to tourists on the beach. But it is the family members themselves who are initially out of pocket. Despite not being aware of Lamin’s plans at first, they ended up making the enormous financial sacrifice to pay for his passage from Libya. “We sent him 45,000 Dalasi ($1,150),” says Pa. “We knew it was a big risk (taking the boat), but we had to support him. Younger brother Bambu agrees. “It is great he is in Europe,” he says, enthusiastically. Lamin is currently housed in a hotel in Italy, awaiting a decision on his asylum claim. He has yet to send any money back to his family.